18 keymilwaukee.com E V E N T V E N U E D I R E C T O R Y Fiserv Forum 1111 Vel R. Phillips Ave. / (414) 227-0500 / fiservforum.com Miller Park One Brewers Way, Miller Parkway / (866) 800-1275 / brewers.com UWM Panther Arena 400 W. Kilbourn Ave. / (414) 908-6001 / uwmilwaukeepantherarena.com BASKETBALL u April 6, 7, 10 Milwaukee Bucks NBA Playoffs begin April 13 In Milwaukee. bucks.com Fiserv Forum SOCCER u April 14 Milwaukee Wave MASL Playoffs begin April 20 in Milwaukee. milwaukeewave.com UWM Panther Arena BASEBALL u April 5-7, 15-21, 29-30 Milwaukee Brewers brewers.com Miller Park HOCKEY u April 3, 5, 6, 9, 13, Milwaukee Admirals milwaukeeadmirals.com UWM Panther Arena MISC u April 27 Brewcity Bruisers Milwaukee's women's flat- track roller derby league. 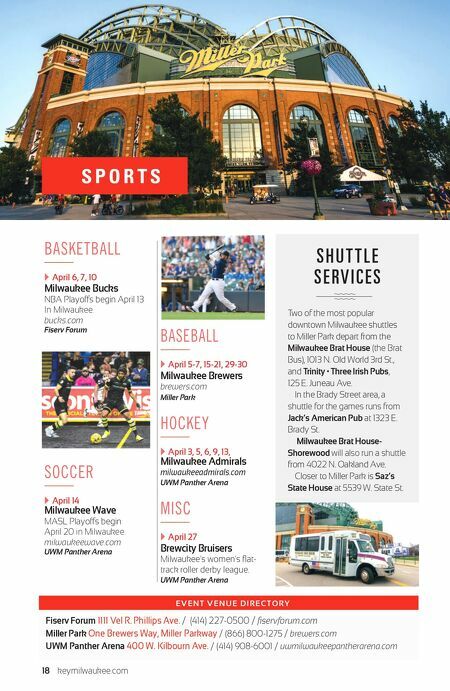 UWM Panther Arena S P O R T S S H U T T L E S E R V I C E S Two of the most popular downtown Milwaukee shuttles to Miller Park depart from the Milwaukee Brat House (the Brat Bus), 1013 N. Old World 3rd St., and Trinity • Three Irish Pubs, 125 E. Juneau Ave. 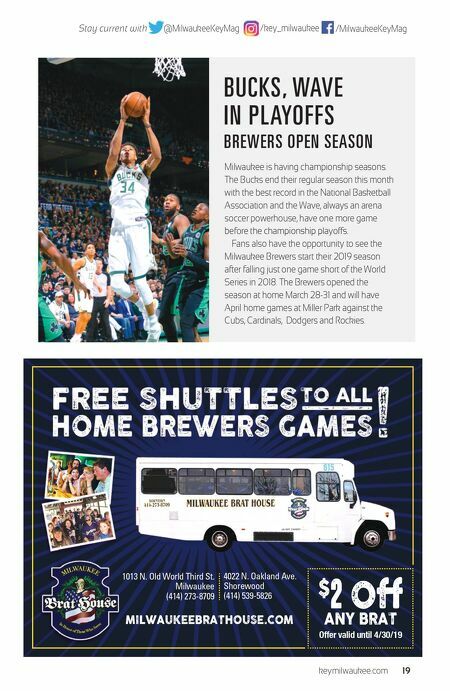 In the Brady Street area, a shuttle for the games runs from Jack's American Pub at 1323 E. Brady St. Milwaukee Brat House- Shorewood will also run a shuttle from 4022 N. Oakland Ave. Closer to Miller Park is Saz's State House at 5539 W. State St.